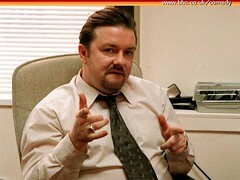 Ricky Gervais is keen to record new episodes of The Office, according to reports. The Daily Star claims that both Gervais, who plays David Brent, and co-writer Stephen Merchant have witnessed the success of the US version, and are longing to write some new material. A source close to Gervais said: "Stephen and Ricky have been getting sent the scripts of the US version of the show – which is now in its third series – and falling about laughing. They’re encouraged to edit the scripts but can’t find fault with them.